On 24th of October 2017, the city of Lendava in Slovenia hosted the 6th Day of the Four Freedoms in the frame of the Eu3doms project. 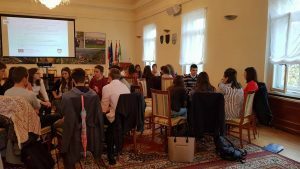 The main goal of the event was to show how project partner organisations in other cities around Europe cope with the questions regarding the youth participation local self-government and implementation of the four freedoms of the European Union. The welcome speech was held by the mayor of the Municipality of Lendava, mag. Anton Balažek. The mayor outlined the importance of collaborative work in this small Middle-European space and expressed his gratitude that Lendava was able to participate in the Eu3doms project. In addition, he described some of the main objectives for the future and pointed out the candidature for the European Capital of Culture in 2025 as an important goal and one of the solutions for two of the main problems this region is facing, high unemployment and negative demographic trends. During the first session, we heard about the experience partner cities have with implementing the EU´s Four Freedoms. Bojana Jevtović, representative of the Belgrade Open School shared her thoughts about the situation of youth in Serbia. Virág Zsár, representative of Héviz, gave an inside view into the work in the field of youth participation and EU´s Four Freedoms in Héviz, one of the biggest tourist destinations in Hungary. Krisztina Mária Imre presented the work of the Harghita County Council and gave an important information about the entrepreneurship in Romania. Stefan Lütgenau, representative of Foster Europe shared his thoughts about the youth policy and how it should be implemented to be successful in practice. Dejan Süč, representative of the Municipality of Lendava, moderated the first session. Panellists agreed that young people from the regions they represent shall go abroad, learn and build a network there. However, the regions of their origin shall become attractive for these people to ensure that after their studies, internship or work experience they go home and capitalize their experiences there. The second session´s main purpose was to provide a platform for local institutions to present themselves. 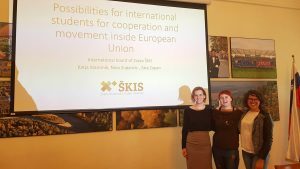 We saw a presentation of possibilities for international student cooperation and movement by the ŠKIS Association. In this part, success stories regarding the exchanges have also been shown. The Bilingual Secondary School Lendava presented the possibilities of cooperation at highschool level. The school, based in Lendava is achieving extraordinary results in the field of robotics and they presented their work and attendance at the World tournament in Japan this year. They also announced their participation at the World tournament in Canada next year. The third part of the event was a divided into two parts. 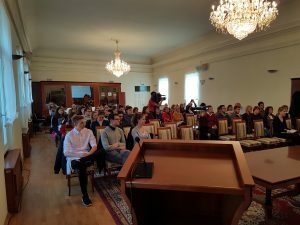 First part were the workshops for secondary school students from Hungary, Romania and Slovenia on the topics of youth involvement in entrepreneurship, tourism, culture, sport and their connections across Europe. Second part was the partners meeting, in which partners did a SWOT analysis on implementing the EU´s Four Freedoms and compared similarities and differences among them. In the last part of the event, participants visited the Lendava castle and enjoyed the exhibition of Salvador Dali before making their way to the Vinarium Tower, the highest lookout tower in Slovenia and a true tourist magnet in the region. The last Eu3doms event will be held in Eisenstadt, Austria, on 15th of November 2017.